This week, I finished reading Start by Jon Acuff. What a book! Jon is hilarious. You can feel his heart as you read his words. He calls his readers to choose awesome, not average, and punch fear in the face in pursuit of a purpose-filled life. I love that. If you want to make positive impact on others, you have to start. Overcome your fears and live the life that matters. What is God asking you to do now? What project? What journey? The way to reach your destination is not by dreaming alone, but by getting up and taking the first step. I’m reading John Maxwell’s book, Talent Is Never Enough and in it he tells the story of Sir Edmund Hillary (as told by Robert Schuller). Hillary was the first man to reach the summit of Mount Everest with a Tibetan friend. Everyone feared to attempt it… until they did. What an amazing display of courage! What’s the Everest staring you in the face? Face it! The mountain cannot get bigger than it already is but you can. You can grow – spiritually and mentally. Become bigger than your Everest. Unholy fear cripples you from taking a step of faith. It limits you. But you can conquer slavish fear by starving it. Quit feeding your fears. 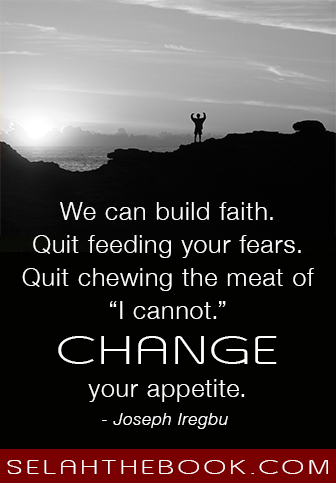 Quit chewing the meat of “I cannot” and start facing the giants. How do you deal with fear in your life? What practical steps can you recommend? Share your thoughts.